# 402, Manjeera Majestic Commercial, JNTU - Hitech City Road, Kukatpally, Hyderabad - 500085, Andhra Pradesh, India. Manasvy developers have a vision to create wonderful dwellings for people to reside and regenerate. The focus is on creating houses that are functional, utilitarian and enchanting. 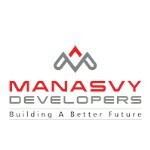 Manasvy developers is a professional firm comprising a dynamic and professionally traind team with adequate experience in construction, particularly adhering high quality standards. The team, at all times,ensures that the highest aesthetics as well as benefits beyond value that translates into customer delight prevails in every aspect of a Manasvy projects.